Today's Fun Find is found at Design Zoo Animal Emporium. We've enjoyed getting to know shop owner Dannette over the past few months. She's an official CCL, currently owned by 3 cats... and a ball python, too! I've ordered several items from Dannette, and I get compliments on them constantly. Check out this handsome figurine by Jim Shore. He sits prominently on the table in our foyer and is our official greeter. This guy is only $21.95 - plus shipping. Not too shabby, eh? AND...Dannette donates a percentage of your purchase to Best Friends Animal Society, too. 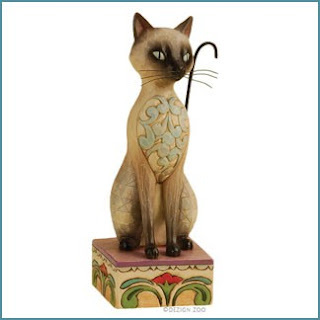 UPDATE: Dannette just contacted me to let us know that all Jim Shore items at Design Zoo - including our friendly Siamese above - are now 20% off if you use coupon code SAVE20 at checkout! 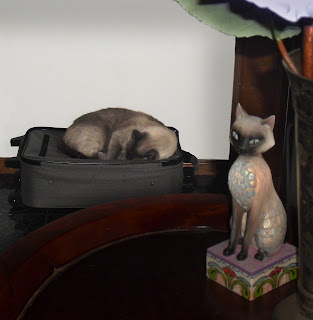 Our figurine watches over Max as he sleeps on my suitcase! The jewelry and figurines in Dannette's store are in limited quantity, and always changing. So check back frequently for new additions. I'm headed over there now - I just saw a gorgeous Siamese figurine on clearance - right next to Mariocat's doppelganger. Lovely figurine! Mom loves Jim Shore's pieces! Me likes that cat! It looks like me! Mr Kitty looks very regal! Psst Allie! A mozzie is a mosquito! And unfortunately, we have LOTS of them...all year round. Thankfully, Mommy is a walking mosquito bait (they LOVE her!) so they don't bug us. MOL. We're gonna go check this out... well, the momma iz anyway... thanks! TW has a small kitty similar to that only gray that she got from @Crazyfusa's Mom for Christmas a few years ago. I love Jim Shore's figurines! What a beautiful statue! We like Jim Shore's work very much!